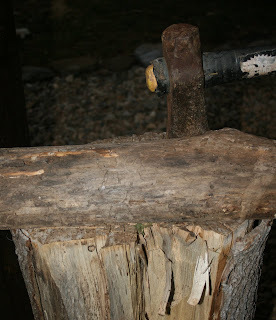 Last night after reading my blog on the wood stove, Paul said, "I'm not obsessed!" And so, my apologies, for calling Paul obsessed with the wood stove. He is definitely not obsessed. His next response was, "How come you didn't write about the spread sheet?!?" Yes, Paul has a spread sheet about the wood stove. But make no mistake. This is not to be considered obsessive. 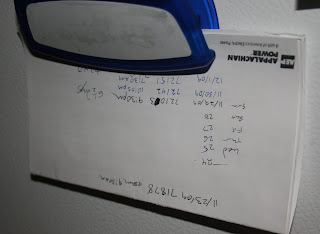 Every night Paul goes to read the meter and jots notes about it on a list that is on our fridge. Nope, not obsessive. He then plugs this data into a spread sheet every few days. It's an accountant thing. Accountants just love spread sheets. When I see a row of numbers, it's as though someone flicks a white noise switch in my brain...all I see or hear is static. Paul sees a row of numbers and the gears start turning and he hears the theme music from Mission Impossible.